As I mentioned last post, I have been recording from the olfactory bulb of awake, head-fixed mice. In general, the responses I'm seeing are in accord with those reported by Shusterman and Rinberg: about half of cell-odor pairs respond to a given odor. In trying to quantify these responsive cell-odor pairs, I stumbled upon another finding, that the odor code for the first breath is different from the rest. One example is shown below (this is the same neuron-odor pair from the previous post, albeit different trials). The top panel shows the PSTH of the cell's response to amyl acetate, with 40ms bins. You can see that before odor presentation, the neuron fired irrespective of phase. During the first sniff of the odor, there was a strong, transient burst of activity in the middle of the breathing cycle. However, in the subsequent sniffs, the cell was inhibited. This cell is excited during the first breath before becoming inhibited. (top) PSTH of the response with 40ms bins. The odor is applied at t=0s. Blue dashed lines represent inpiration. (middle) PSTH of the response with a single bin for each breath. The cell is inhibited during breaths 2-4. (bottom) Cumulative distribution of spikes during the ctl breath (black), first breath (blue), and second breath (red). While seeing the difference by eye is nice, I wanted to test these withous bias and quantitatively. To detect tonic changes, I averaged the firing rate for each breath, as shown in the middle panel. In this example, over the whole breath, the first sniff's firing rate does not differ from the control breaths'. However, the three subsequent breaths are all inhibited. 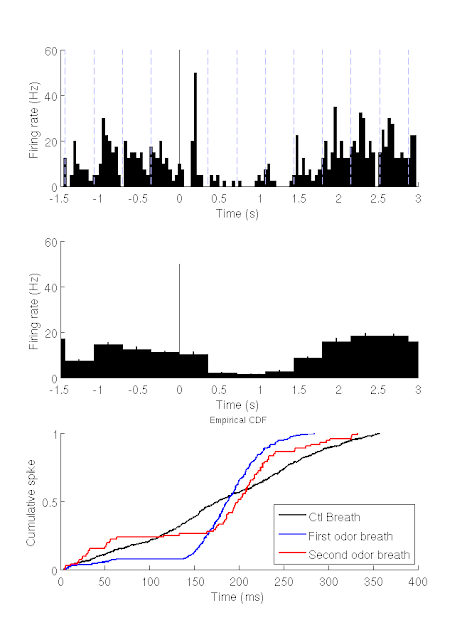 To look at the phasic changes, I plotted (for ten trials) the cumulative spike times for control breaths and breaths during the odor (bottom panel, above). Before the odor, the spikes occur without phase bias (black line), while during the first breath you can see that most spikes come between 150-200ms of the breathing cycle. However, on the second breath, the phasic nature of the response has begun to dissipate. The transformation between the first and second breath can take many forms. The example above shows a neuron that switches from a strong, phasic, excitatory response to an inhibitory response. Many other neurons are inhibited during the first breath but not afterward. Below is a more subtle example, where the neuron does not respond to ethyl butyrate during the first sniff. However, on the subsequent sniffs, the timing of the response shifts to earlier in the breathing cycle. This cell appears to not respond during the first breath, but has a phasic response during later breaths. Rather than exhaustively quantify how individual cells change their code between the first and second breath, I took a different approach and looked at the population code. I have three experiments where I was able to record from at least ten cells at the same time. 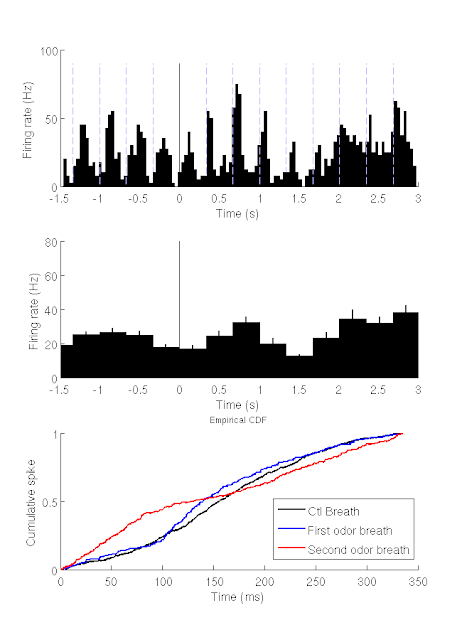 For these three experiments, I created a population vector of the responses to odor, and calculated the "spike distance" between the representation of each breath. Another way to think of spike distance is how dissimilar two representations are: small spike distances imply similar population representations. All distances were normalized to the average distance between control breaths. The odor code for the first breath is as different from control as it is from the 2nd breath. A. For each breath during an odor, I created a "population" vector, where for each breath and cell, I broke the response into eight bins. To reduce the dimensionality, I performed PCA. To calculate the distance, I used the first five PCA scores for each breath. B. Normalized "spike distance" between odor code for different breaths. All distances were normalized to the average distance between control breaths (C) for an experiment-odor pair. All post-odor breaths are distant from the control breaths (white). The first breath is also different from the 2nd-4th breaths (blue). However, the 2nd-4th breaths are relatively similar to each other (red). The population response during all of the odor breaths are distant from the control breaths (white bars). The distance here presumably encodes the presence of the odor. However, if you look at the distance between the first breath and subsequent breaths (blue bars), you can see they are also quite far apart. In fact, the first breath is almost as distant from the other breaths as it is from the control breaths. In contrast, the distance between breaths 2-4 is much lower, and almost comparable to the distance between control breaths. When I showed this to my boss he was not impressed, and said they had already showed this in a previous paper. And indeed, buried in three panels of Fig. 4, they did show something similar (below). There are some significant differences, though. First, those experiments were in anesthetized animals, rather than awake animals. Second, I've shown that individual cells use strikingly different codes between breaths. Third, they did not create their population vector to consider a cell's firing as a whole. This could change the interpretation of the results. In any case, asking around the lab, no one seemed to remember this was even in the paper. The velocity of the population representation is highest during the first odor and post-odor breaths. A. The population vector contains the firing of each cell in a given time-bin. B. Cross-correlation and distance for the population during a given odor. C. The velocity of the population vector (how much the distance changes) is highest at the beginning and end of odor presentation. From Bathellier, et al, 2008. Given this result, one needs to be careful with how one characterizes "responsive" cells in the olfactory bulb. First, when determining whether a cell-odor pair is responsive, one needs to always look at more than just the first breath. For example, the second cell shown above was responsive during the second breath, but not the first. Second, when characterizing responses, it is difficult to say whether a cell was excited or inhibited, as cells can be both excited and inhibited in a given breath, as well as be excited for one breath but not others. While it may be unsatisfying, it is probably best to just call them "responsive" cells. These results also gave me an idea for an experiment to test whether the difference in coding is perceptually important. It is now possible to stimulate the olfactory epithelium via Channelrhodopsin while mice sniff (using an OMP-ChR2 line), which makes it possible to mask an odor response with olfactory white noise. To test how important different sniffs are to perception, you would start by establishing the detection threshold for an odor. Then you could measure the detection threshold while masking either the first or second sniff with the olfactory noise. There are a few possible results. First, the threshold might not change at all, as both the first and second sniff contain sufficient information to detect an odor. Second, the sensitivity could be equally decreased when either sniff is blocked. This would also imply their is equal information in each sniff. The third possibility is that masking the first sniff would decrease sensitivity far more than masking the second sniff (which is what I expect). It has been shown that mice and humans can detect odors in a single sniff. And in daily life, no odor is as strong as its first whiff. The difference in odor coding between the first and second sniff might be one step towards explaining why. While this is pretty basic analysis, I had to perform this en route to doing more sophisticated comparisons while trying to measure a form of plasticity in the odor code. This is also the first complete data I've shown from this lab. I would appreciate any feedback on this, as it's always useful to get a perspective outside the insular confines of a lab. Were the figures legible? The analysis convincing? Or is this entirely un-novel?